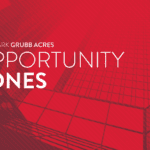 Created as part of the Tax Cuts and Jobs Act of 2017, Opportunity Zones (OZs) offer tax benefits to investors beyond traditional real estate groups. Large owner-users of real estate, such as universities and well-capitalized companies, as well as local business operators and retail investors with ties to the 8,700 census tracts that now qualify as OZs, all stand to benefit from the program. However, while the legislation is still in its infancy, the deadline for investors seeking to maximize the deferral benefits for invested capital gains is quickly approaching. 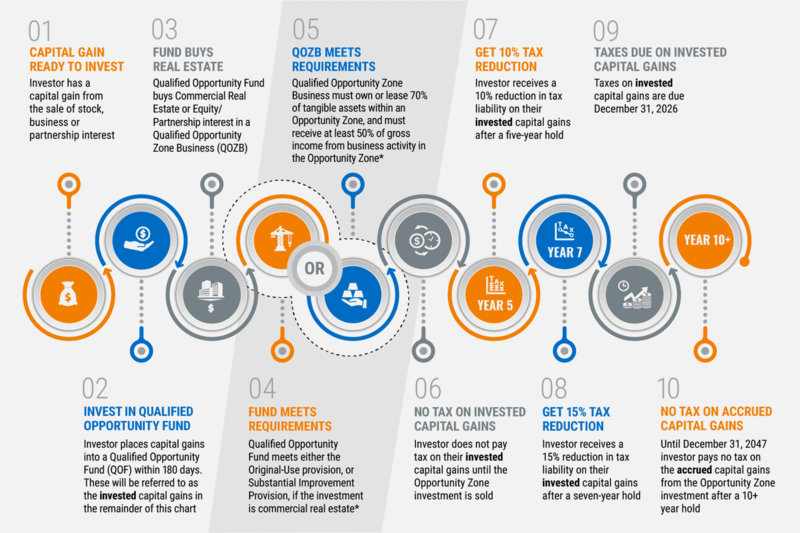 December 31, 2026 is the date when Opportunity Zone investors must pay the deferred capital gains tax on their invested capital gains, regardless of when they invested in either Opportunity Zone Property or Businesses (via equity or partnership interest). Invested capital gains are subject to two reductions in capital gains tax liability, a 10% reduction at the 5-year hold mark, and a 15% reduction at the 7-year hold mark. Therefore, December 31, 2019 is the last date to take advantage of the full 7-year (15% reduction) benefit. The 10-year-plus hold benefit, of 100% capital gains tax forgiveness, only applies to the accrued capital gains from the Opportunity Zone investment and is valid as far out as December 31, 2047. In response to the impending deadline, an estimated $20+ billion is currently being raised by funds nationally, for the purpose of investing in Opportunity Zone product. Groups range from traditional institutional investors such as Normandy Real Estate Partners and RXR Realty, to specialty investment managers and private equity such as EJF Capital and Virtua Partners. The amount of investment volume recorded in areas now designated as Opportunity Zones has expanded considerably this cycle, even before the Opportunity Zone legislation was created, in response to compressing yields in coastal gateway markets. In this lower-yield environment, investors have had to chase yield into emerging neighborhoods on the perimeter of large gateway markets, or into smaller non-gateway markets. Similarly, groups have begun to focus on opportunistic and value-add fund strategies to meet return targets and satisfy their investors. In 2018, the sales volume in Opportunity Zones nationally reached a peak of $60 billion, a 94% increase from just five years earlier. The majority of this volume, or 65%, occurred within non-gateway cities. The favored product for Opportunity Zone investors is unused or underdeveloped land, vacant buildings, and low-quality Class C commercial and multifamily properties. Investment in these types of product is consistent with the requirements of the legislation, and also many funds’ preferences for opportunistic and value-add strategies. One example of such Opportunity Zone investments is the planned redevelopment of a former enamel product factory site in Southeast Baltimore. While local developer MCB Real Estate bought the 20-acre PEMCO site in 2014 before the legislation was passed, it has recently brought on Prudential, which has created a Qualified Opportunity Fund (QOF). That fund will invest $150 million in the development of 100,000 square feet of office, more than 80,000 square feet of retail, and more than 300,000 square feet of multifamily in two build phases. The rebranded Yard 56 will include credit retail tenants such as LA Fitness and Chipotle and is anticipated to become a viable work-play-live district. The Opportunity Zone legislation will help improve the after-tax IRR of the project and help offset the costs involved with demolishing the site and complying with a mandated environmental cleanup. Another example of an Opportunity Zone transaction is Virtua Partners’ purchase of a 3.6-acre plot of land in Tempe, Arizona, where the firm will build a 90-unit multifamily property with an affordable component. Also notable: the crowdfunding platform Fundrise’s purchase of a long-vacant mixed retail-residential property in the LeDroit Park neighborhood of Washington, DC. What Are the Implications for You as Property Owners/Developers? Despite the delayed release of additional guidance from the IRS, investors remain undeterred and are beginning to close on some of the first Opportunity Zone investment transactions. In fact, funds have found that raising capital for investments that are marketed as Opportunity Zone transactions can be easier and quicker, aided by a wider pool of potential investors, capital, and publicity. They have also discovered that many local community governments have been accommodating of permitting and zoning for Opportunity Zone projects, particularly for sites that the private sector would not develop under normal circumstances. Additionally, the type of product being developed typically achieves higher yields for funds while satisfying the goal of the legislation, which is to uplift impoverished areas by developing commercial spaces that encourage job growth and economic activity. This kind of social impact is increasingly being targeted by institutional investors and funds, which exclusively select investments that will create positive measurable social or environmental change, while avoiding all “sin” investments that have proven negative impacts on society. There is some skepticism surrounding the Opportunity Zone program on the grounds that it may yield more tax benefits for investors than economic benefits for areas in need. However, the program thus far appears to be generating considerable investor interest, a necessary condition for achieving its policy objectives.